“I try to focus on running the very best that I can, literally moment by moment,” said Lizzy Hawker, a 36-year-old British ultrarunner. Lizzy Hawker had just finished running a nine-stage race through some of Nepal’s wildest trails when she learned that her flight back to Katmandu, about 200 miles away, was canceled because of bad weather. In August, Hawker won the Ultra-Trail du Mont-Blanc, a 104-kilometer race that included 6,000 meters of climbing. So, rather than wait for the next flight, she ran there. There were no cheering fans, other competitors or prizes. Instead, Hawker, a 36-year-old British ultrarunner, was intent on beating her time over the same route from 2007, which was 74 hours 36 minutes nonstop. Few cared if she broke her record or abandoned her effort. The competition was with herself. About halfway through the run, where her route turned from trail to road, Hawker met her friend Roger Henke from Katmandu and three other Nepalese runners. Their van held food, water and a back seat for napping. Late in the second day, Hawker was nauseated and having problems with coordination, Henke said. The van followed Hawker through the last leg of the run, with Henke and the others taking turns running alongside her. “Throughout the three days, she slept maybe four and a half hours, never more than 50 minutes at a time,” Henke said. She set a personal record to Katmandu from Everest Base Camp of 71 hours 25 minutes. Hawker has a reputation for pushing farther, faster and more often, even by the standards of other ultrarunners. In a four-week period in 2012, she won the Ultra-Trail du Mont-Blanc, considered one of the toughest trail challenges; overcame a fall to win the women’s 100-mile Run Rabbit Run in Colorado; and set a course record for women in the 155-mileSpartathlon Ultra Race in Greece. Many ultrarunners would consider that a full year of competition. But Hawker routinely flouts conventional wisdom, partly because she is able to recover so quickly. During peak training and racing periods, she can log 12 to 14 hours a day on trails over three to four days, with a few 150-mile weeks. Hawker’s résumé tells a different story. She holds a doctorate in polar oceanography from Cambridge, has won the women’s Ultra-Trail du Mont-Blanc five times, and has finished first in more than 35 trail ultras, including the Annapurna 100, the North Face 50-Mileand the Transgrancanaria 123K. Unlike most ultrarunners, Hawker challenges herself on all surfaces. She won the 100K world championship in 2006 and set a 24-hour world record by running a 1-kilometer loop of asphalt 247 times at the Commonwealth Championships in September 2011. She has reached the summit of the 22,349-foot Ama Dablam in the Himalayas without oxygen and was named a 2013 National Geographic Adventurer of the Year. But Hawker said her greatest accomplishment was having the courage to try something new, which was how her career as an ultrarunner started. In August 2005, Hawker and some friends were camping near Chamonix, France. Her friends went home, but Hawker was intrigued by the Ultra-Trail du Mont-Blanc, a roughly 103-mile circuit of the mountain that begins and ends in Chamonix. She took her headlamp, a borrowed backpack that was too big for her 5-foot-4 frame and a pair of trail shoes that she had bought at the last minute, and headed to Chamonix. “At the start, I was thinking of a line from ‘Alice in Wonderland’: ‘Begin at the beginning and go on till you come to the end. Then stop,’ ” she said. She ran the race with a sense of wonder rather than trepidation, ogling buffets of food at aid stations. She was surprised to be the second woman through the first major checkpoint. It was then that she thought she should really start running. She enjoyed the solitude of running through the night in the tiny bobbing circle of her headlamp, making it through the race one checkpoint at a time. 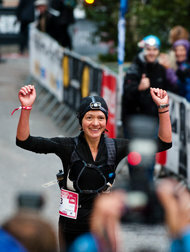 She was the first woman to finish, 24th over all, in 26 hours 53 minutes. When pressed about pushing her body to perform without sleep for more than 24 hours, she could identify only one low point in the race. It was in the pouring rain with five or six hours of running remaining. After the race, the apparel company North Face approached Hawker with an offer of sponsorship. Extremely independent — she trains on her own, coaches herself and belongs to no club or team — she accepted the offer, hesitantly. “I wanted to be sure of what they expected in return,” she said. Over a period of years, she built up trust with the company. From 2005 to 2008, she kept her research position with the British Antarctic Survey and used her vacation time to race. With a small stipend from North Face and additional money from writing, editing and coaching for the Laufschule Scuol, a training center in Switzerland, she left her job and moved to the Swiss Alps in 2008. The soaring Alpine terrain is a far cry from her childhood in Upminster, a suburb of London. Her passion for mountains began when she was 6 on a family vacation to Zermatt, Switzerland. “Maybe it was just a reaction to suburbia, but I felt at home there,” she said. Hawker’s work ethic also started at a young age. For Hawker, there is no joy in unearned rewards. She has said she would need to hike to the top of a mountain to be able to enjoy skiing down it. She would never buy a lottery ticket, because if she won, she would not feel she had earned the prize money. Her work ethic, and the mental fortitude it built, have helped make her one of the top endurance athletes in the world. It requires a strong mind to balance the two competing thoughts at the core of endurance running: listening to one’s body and ignoring it. But why Hawker continues to push herself to extremes is hard for some to understand. Most ultraraces, like the Ultra-Trail du Mont-Blanc, offer no prize money. Even the top ultrarunners are little known outside the sport and work other jobs just to get by. Injury is endemic, and suffering is part of the pursuit. Alone, cold and tired on the trail, she, too, sometimes questions why she does this. “You have to give yourself a good answer to carry on,” she said. “I think we’re all looking for that edge, challenging ourselves, whether that’s expressed through music, writing, raising a family or endurance running. This entry was posted in Uncategorized and tagged fitblr, inspiration, running. Bookmark the permalink.